A valuable study of the science behind the medicine, Muscle: Fundamental Biology and Mechanisms of Disease brings together key leaders in muscle biology. These experts provide state-of-the-art insights into the three forms of muscle--cardiac, skeletal, and smooth--from molecular anatomy, basic physiology, disease mechanisms, and targets of therapy. Commonalities and contrasts among these three tissue types are highlighted. 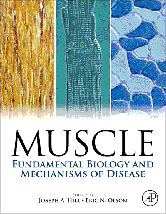 This book focuses primarily on the biology of the myocyte.